(2015-10-17, 02:35)Milhouse Wrote: Doesn't tvheadend have it's own log? Is tvheadend listening on port 9981? Does tvheadend work with #1015 (the only difference between the two builds should be the way libnfs is compiled)? Thanks. I uninstalled the existing one and installed the new #1015 tvh addon and that got it working. (2015-10-17, 00:19)BubbleBobble Wrote: For me 3D is working out great. I had no stuttering whatsoever. Frame packing at 1080p/23.97 and it goes as smooth as my stand alone bluray players. One time i had a out-of-sync but that sometimes happened on other sources as well so i don't dare to blame it on my Raspberry. I have a problem with subtitles though. Every now and then the font is really large and shown half on the screen. Not for me . Going to do a clean install and try build #1014 as you have. Then I updated to build #1014. Just tried that, same issues no matter what (UI at Desktop, 1080p/60.00Hz, 1080p/59.94Hz, or even 1080p/50.00Hz, which previously seemed to do the trick). I have 2x Pi2's with different mSD cards in them, so this isn't some issue with a particular Pi2. I even kept original Confluence skin, no add-ons, and just did plain vanilla file playback of 2D and 3D. Same problems with both Pi2's and my Epson 5025UB PJ, via Onkyo NR636 AVR. No issues with my Chromebox with exact settings with same 2D files, and no such issues with my HiMedia Q5 and same 2D and 3D files. 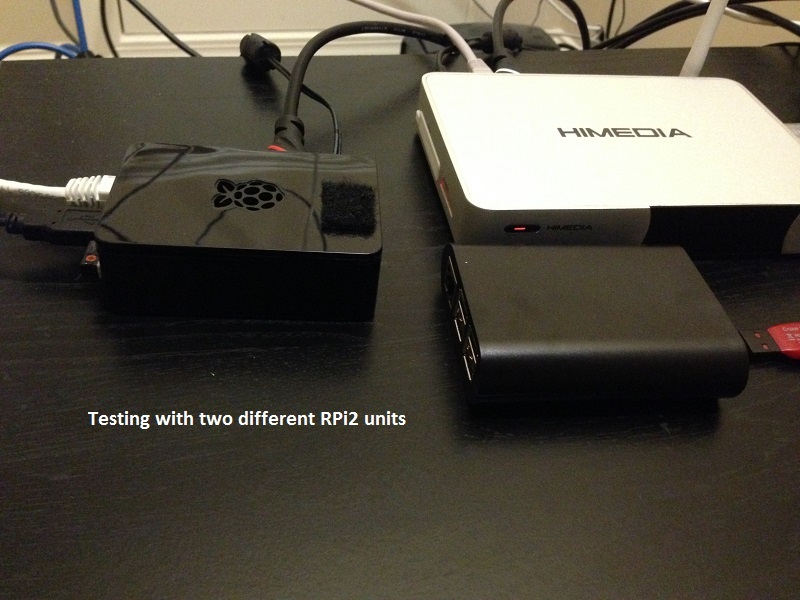 At this stage, I'm pretty frustrated with Pi2 and may give up for a while at least. Spent way too many hours trying to get it to work right, even with 2D. Always same issue... play a video for 15-20 secs, stop, then play next and blank screen. Or, if I'm lucky, happens after 3rd video playback or 4th. With 3D, same damn thing. There's something with Pi2 and the signal switches (the way it's sending them) that my PJ doesn't like. Not just Epson 5025UB, but also BenQ W1070. But, issue is worse on Epson. At this point, I've tried most builds from #0916 to #1016. It could be a hdmi handshake issue? Have you tried to connect your Raspberry directly to your projector? To get the most simple hdmi setup. No AVR and other splitters/switches. We have the same projectors, raspberry's and software. I used to have an Yamaha AVR and no issues. My Anthem MRX 300 AVR however is a screw-up with handshaking. I split the hdmi signal so my AVR doesn't need to feed my projector. Worth a shot. Will try later today. If you happen to have a 6ft or longer hdmi cable then try with that. (2015-10-09, 14:18)doveman2 Wrote: Is there anything in this log that shows why Putty/SSH isn't working on my brother's RPi v2? I checked in the OE settings addon that SSH is enabled and deleted the files in .cache/ssh to let it recreate them. I can connect with WinSCP, which I think uses the same SSH key but when I try with Putty it can't connect and I just get an empty black window until I cancel it. No. You'll need to enable PuTTY logging to view the communication handshake between PuTTY and OpenELEC to get an idea of why it's not working. RSA keys were recently deprecated by OpenSSH, so you may need to switch to DSA or ECDSA keys (however the latter are only supported in PuTTY when using the "development" build). I just had a chance to gather a PuTTY log from his machine. It gets to "Doing Diffie-Hellman group exchange" before it gets stuck. (2015-10-17, 19:41)hdmkv Wrote: Worth a shot. Will try later today. Also I'd like to know if unplugging and replugging the hdmi cable fixes the issue. If it does it means we are outputting a valid signal, but the projector didn't spot the change. If it doesn't it probably means we are outputting the wrong signal. Quote: he "old" HDMI spec does not specify a way of exiting 3D mode (shame on HDMI LLC). Hence some TVs will get stuck when the source is no longer sending a 3D signal. HDMI 2.x spec mandates TVs must switch back to 2D mode when the 3D side band signal is absent (basically we just stop sending VS infoframe when exiting 3D mode). I don't think there is anything the source can do other than unplug/plug back the cable or output a different format to force the TV to resync again. I'm surprised TVs will not react to the difference between full frame packing and 2D signal as the timings are different. I will expect TV not reacting to switching between side by side/top-bottom and 2D mode only. [Of course there will always be TVs which can only enter 3D mode and remember the last seen 3D mode until "no signal" and a new 3D mode is observed, which is probably the user's problem]. My suspicion is that the projector is badly implemented and doesn't react to the 3D signalling going away. It must be possible to "persuade" it to switch to 2D. It seems sending many seconds of "muted" video didn't help. Other options are to drop the signal for a short period (i.e. power off the HDMI output), or switch temporarily to a very different signal (e.g. VGA60). I attempted the second option before, but obviously broke something. You can see the tvh logging in journalctl. Quote: Also I'd like to know if unplugging and replugging the hdmi cable fixes the issue. @BubbleBobble, thanks for your suggestion. Should have thought of this myself before. Anyway, after months of trying to figure out why the display blanking out was happening, I've found the cause... my AVR, an Onkyo TX-NR636. When I connect directly to my Epson 5025UB, no problems... it always comes back to the Kodi UI after every playback & stop. So, I looked at my NR636's menu and ensured video was being passed through as it, without any processing. Lip synch under HDMI was enabled, so turned that off too. Also made sure latest firmware was installed on the Onkyo. Didn't help, as issue returned as soon as I connected my Pi2 via the Onkyo. I don't get it why though... my Chromebox, HiMedia Q5, Zidoo X6 and TiVo, all connected by this same AVR don't exhibit the issue. Why only Pi2? Also, the Onkyo NR636 is/was a hugely popular AVR. When I have time tomorrow, may drag my Pioneer 5.1 AVR from another room and try via Epson. Edit: Just found this; Onkyo may indeed have some HDMI connectivity issues . Rated best receiver by Wirecutter too. (2015-10-17, 22:28)speising Wrote: You can see the tvh logging in journalctl. I feel your pain... my Anthem AVR got great reviews too but messes up when it comes to hdmi. Before the splitter i have 'Dr HDMI' so every source "gets" the right info (EDID) I have 7.1 audio, 3D, full HD, etcetera. (2015-10-17, 22:53)hdmkv Wrote: @BubbleBobble, thanks for your suggestion. Should have thought of this myself before. Anyway, after months of trying to figure out why the display blanking out was happening, I've found the cause... my AVR, an Onkyo TX-NR636. When I connect directly to my Epson 5025UB, no problems... it always comes back to the Kodi UI after every playback & stop. BTW, I have an Onkyo TX-NR609 and that doesn't have the 3D switching issue.